Just a normal week at our house....home, friends, and spring clinging! You can read all about it below. Photography Tip: My tip for this week would be to include the whole picture. Don't always take close ups. Sometimes you need to capture a whole room or group of people to get a feel for what is going on. I don't know about you, but I have difficulty taking those kinds of photos AND scrapping those kinds of photos. As a result, I tend to take less of those and just focus on the close ups. I find myself having to make myself just do it! You'll see that this week's page has a lot of photos with a LOT of stuff going on. 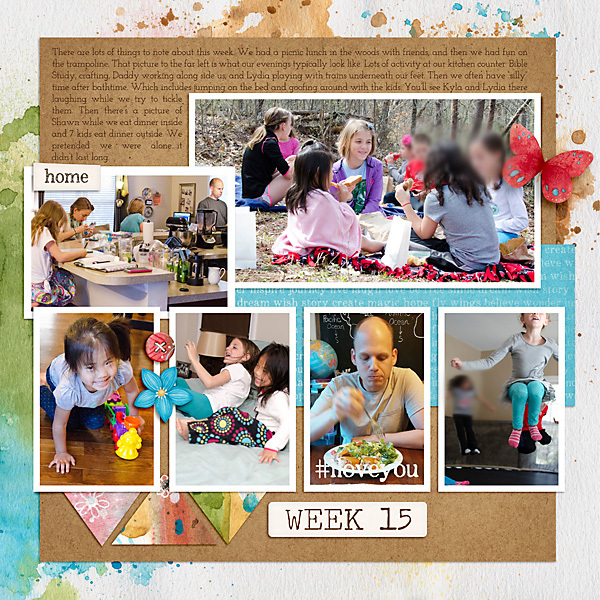 While it may not make the most visually appealing page, it does capture our week, and I know my kids will enjoy seeing the whole picture....all their friends and our our messy kitchen! 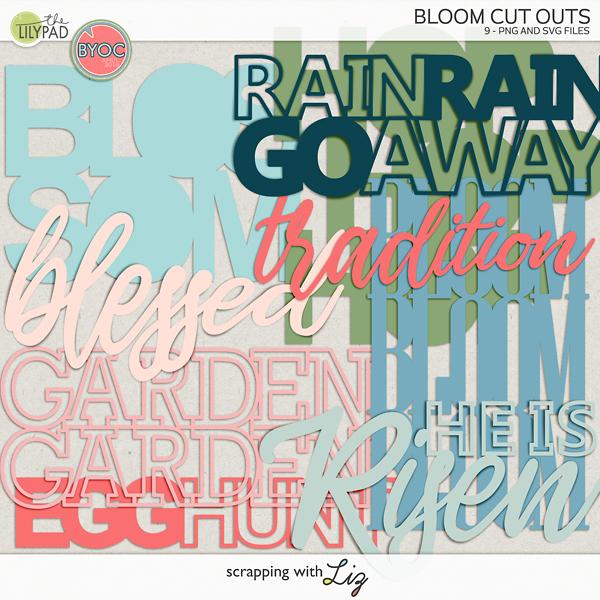 Scrapbook Tip: I think I gave this tip before, but since I had to do it a lot with this template I'm going to say it again: Add photo spots, resize photo spots, move photo spots, etc... to work with what you've got. 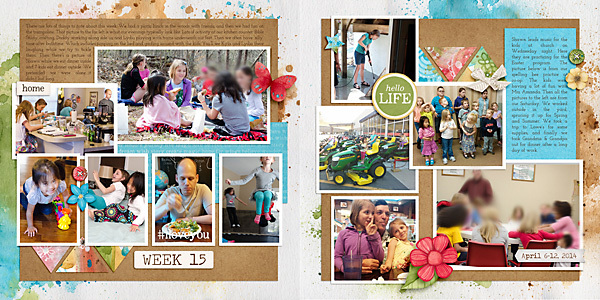 I added one photo spot and resized 3 photo spots for my page. I even moved some of those triangle pieces around. 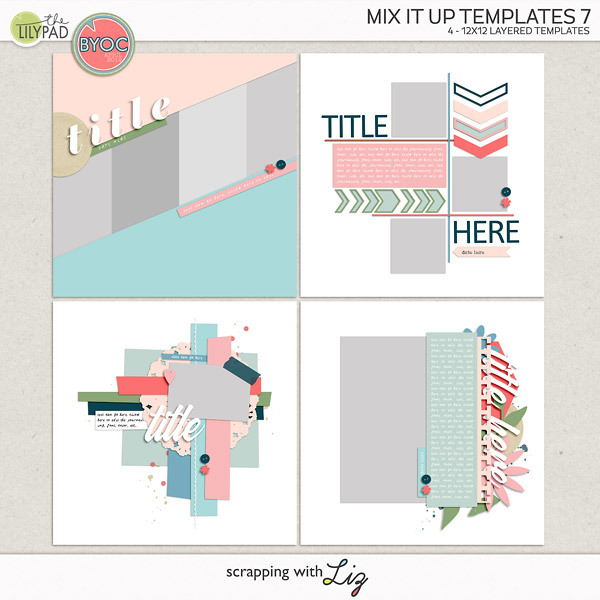 Here's another tip: Rearrange before you start scrapping. I looked at my photos. I knew I needed one extra photo spot, so I added that. Then I added my photos. 3 of my photos just weren't fitting the photo spots. While the photo was still clipped to the photo spot I resized the photo mat layer and photo layer. Once I got the pictures just the way I wanted I started adding in the papers and elements. Journaling Left Side: There are lots of things to note about this week. We had a picnic lunch in the woods with friends, and then we had fun on the trampoline. That picture to the far left is what our evenings typically look like. Lots of activity at our kitchen counter: Bible Study, crafting, Daddy working along side us, and Lydia playing with trains underneath our feet. Then we often have “silly” time after bathtime. Which includes jumping on the bed and goofing around with the kids. You’ll see Kyla and Lydia there laughing while we try to tickle them. Then there’s a picture of Shawn while we eat dinner inside and 7 kids eat dinner outside. We pretended we were alone....it didn’t last long. Journaling Right Side: Shawn leads music for the kids at church on Wednesday night. Here they are practicing for the Easter program. The picture below is from our spelling bee practice at co-op. The kids were having a lot of fun with Mrs. Amanda. Then all the pictures to the left are from our Saturday. We worked outside in the yard, sprucing it up for Spring and Summer. We took a trip to Lowes for some supplies, and finally we took Grandma and Grandpa out for dinner after a long day of work. And as usual, here's your Daily Life Journal Card Freebie. Enjoy! 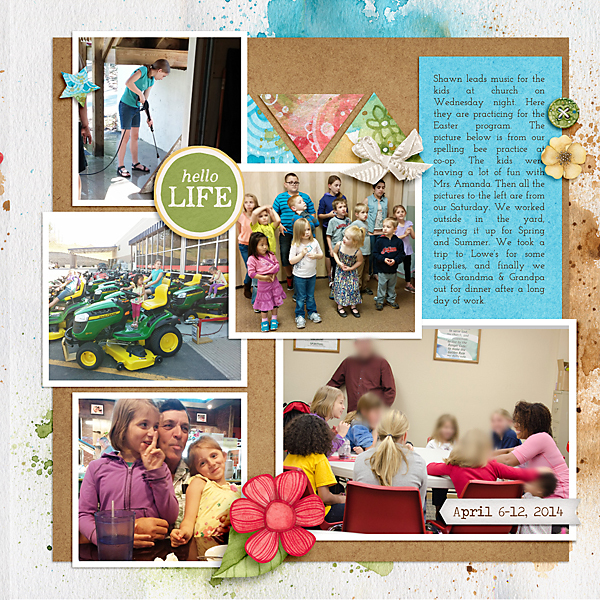 Thanks Liz for another great journal card template!!! 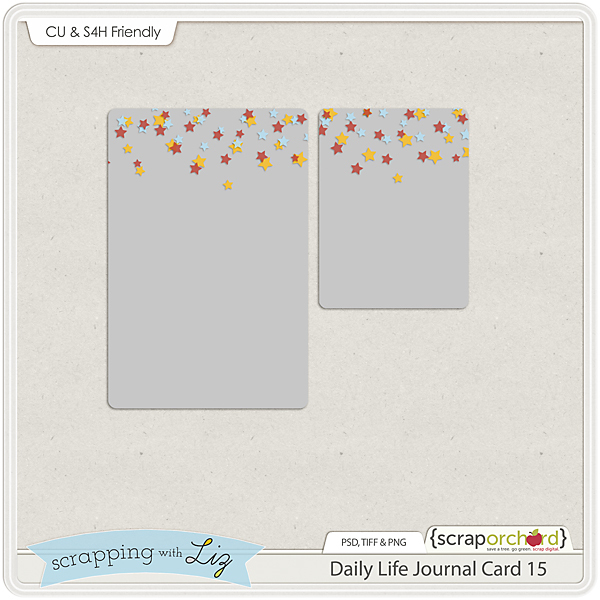 Thank you for the JC template - I love the scattering of stars!